MANILA, Philippines — Labors groups over the weekend called out a weekly TV gag show for what they said was the "malicious portrayal" of striking workers as doing it for money. Bukluran ng Manggagawang Pilipino and Alyansa ng Progresibong Obrero ng Yin Gang Motorcycles said GMA 7's "Bubble Gang" on Friday "ran several short skits portraying striking workers getting paid P100 each by the strike leader." The portrayal was a "blatant lie," BMP chair Leody de Guzman, a senatorial candidate with the Labor Win coalition, said. "Labor strikes are serious actions being waged by workers in order to compel companies to respect union rights and comply to labor standards. This is a right guaranteed by our Constitution and the Labor Code," De Guzman said. 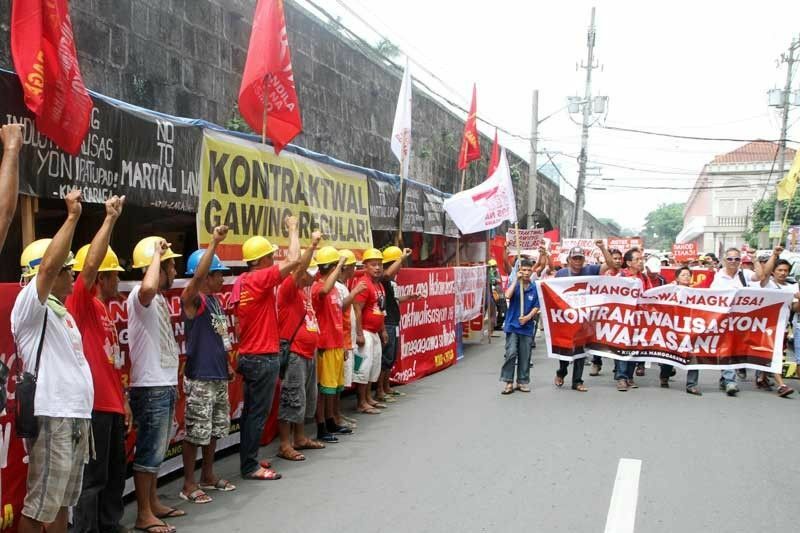 The Labor Code of the Philippines defines a strike "as any temporary stoppage of work by the concerted action of employees as a result of an industrial or labor dispute." It also holds that "the right of legitimate labor organizations to strike and picket and of employers to lockout, consistent with the national interest, shall continue to be recognized and respected." De Guzman said that mass media has been "propagating the culture of apathy and that principles can be bought" instead of "propagating the upholding of the people's basic rights." The perception that workers go on strike and that activists join rallies because they are paid to do so is common but inaccurate. Jeremy Carpe, president of APOY and a contractual worker in Yin Gang Motorcycles in Valenzuela City, said workers do not strike to get money. He said YGM had offered union members a "relatively large" separation pay to end the strike and leave the company. "But what will we do with the money if we'll still be contractual workers when we change jobs?" he said in Filipino. "What we want is regular jobs, correct benefits, and the right to form unions because our daily needs are regular. We do not want alms." APOY went on strike last week to assert their regular status and to call for the reinstatement of officials and members who had been dismissed by the company as well as to push for the revision of unjust company policies. BMP national president Luke Espiritu said in the same release that joining a strike is a "huge sacrifice by the workers" and not something done for a mere P100. "[W]orkers have to temporarily leave their families, live in makeshift tents, sleep on concrete, endure insect bites and harsh elements, and under the permanent threat of violence by management’s strike breakers or the police," he said. "Such sacrifice is not worth P100 each," he stressed. According to the National Wages and Productivity Commisison, the minimum wage for non-agricultural workers ranges from a low of P280 a day in the Autonomous Region in Muslim Mindanao to P537 a day in the National Capital Region. Adjusting for inflation and prices, that is P220.13 (ARMM) to P459.76 (NCR) in real wages a day. GMA Network has yet to respond to the labor groups. "Bubble Gang" has yet to respond to a request for comment coursed through its social media page as of this post. The labor sector is not the first to take offense to portrayal of its members on TV. Last November, Director General Oscar Albayalde, Philippine National Police chief, complained about the portrayal of police officers on ABS-CBN's "FPJ's Ang Probinsyano", which led to the police temporarily dropping support for the show. "That kind of portrayal of the PNP is unfair," Albayalde said then. "Like the chief of the PNP himself is a villain—I don't think that has ever really happened to us." At one point, the Department of the Interior and Local Government even mulled filing charges of Illegal Use of Uniforms or Insignia over the allegedly unflattering portrayal of police. In 2012, a congressman filed a resolution urging the TV and movie industry to "minimize, prevent, or stop typecasting congressmen and congresswomen as villains or crooks in movies and telenovelas, which create stereotypes or negative public perception of members of the House of Representatives." The congressman who filed the resolution said then that the portrayals "sully the good name of honorable congressmen and congresswomen who work hard for the welfare of their constituents."